No single person is responsible for the revolution in genetic data collection that has reshaped biology over just a handful of decades, but if you had to make a list of people deserving credit, Craig Venter’s name would be among the first entries. Venter is probably best known as the leader of a private team that matched the National Institutes of Health in a race to draft a sequence of the human genome, but that achievement is just the headline for a long list of pioneering work in basic molecular methods and bioinformatics. 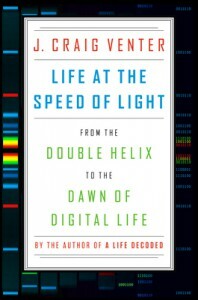 In Life at the Speed of Light (Viking, $26.95 in hardback) Venter narrates a century of basic science leading up to the human genome project and beyond to his leadership of a project to assemble a working bacterial genome from raw nucleotides. From there, he envisions a not-too-distant future of living systems modeled entirely in silico, built to order, and transmitted across interplanetary distances. Venter opens the book with a 1943 series of lectures by Erwin Schrödinger, in which the physicist addressed the question of the nature of life itself—and speculated that the operations of living cells are controlled by an “aperiodic crystal,” a molecular structure capable of containing instructions for life and transmitting them to daughter cells. 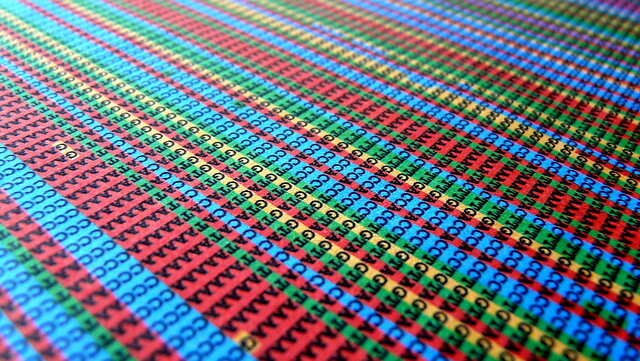 As Venter argues in a swift survey of scientific discoveries leading to our understanding that this structure is DNA, the questions of how living things are built, operated, and propagated have always been tied to the question of what, exactly, life is. Venter’s answer seems to be that life is whatever happens when the instructions in DNA sequences are read and carried out. This is, arguably, exactly what he and his collaborators demonstrated when they assembled the entire genome of the bacterium Mycoplasma mycoides one nucleotide at a time, then inserted the resulting chromosomes into the cells of a related bacterium and watched the synthesized “software” boot up. Venter recounts the work leading up to that moment in clear and careful detail, giving credit to seemingly every contributing scientist—yet for all the names, this narrative is only marginally more personal than the Methods section of a scientific paper. Almost nothing of the drama of scientific puzzle-solving comes through, as one or another group of the collaborators simply does the next thing to surmount each challenge as Venter describes it. There is, however, not much discussion of the kind of work most molecular ecologists do—work to understand variation in genetic sequences. Venter’s sequencing of microbial DNA from a sample of Sargasso seawater—the founding project of modern metagenomics—gets a passing mention, but Life at the Speed of Light is only interested in historical evolutionary relationships or variation within populations if they can be used to optimize the minimum genetic code for a single living cell, or to find genes with interesting medical or industrial applications. In spite of, or perhaps because of, that narrow focus, Life at the Speed of Light is a fine, compact introduction to the science of life’s inner workings. Its ultimate value may not be in providing behind-the-scenes details of the most important recent advances in biology, but as a manifesto on what they mean, direct from one of their co-creators. Gibson, D. G., J. I. Glass, C. Lartigue, V. N. Noskov, R.-Y. Chuang, M. a Algire, G. a Benders, M. G. Montague, L. Ma, M. M. Moodie, C. Merryman, S. Vashee, R. Krishnakumar, N. Assad-Garcia, C. Andrews-Pfannkoch, E. a Denisova, L. Young, Z.-Q. Qi, T. H. Segall-Shapiro, C. H. Calvey, P. P. Parmar, C. a Hutchison, H. O. Smith, and J. C. Venter. 2010. Creation of a bacterial cell controlled by a chemically synthesized genome. Science 329:52–6. doi: 10.1126/science.1190719. Venter, J. C., M. D. Adams, E. W. Myers, P. W. Li, R. J. Mural, et al. 2001. The sequence of the human genome. Science 291:1304–51. doi: 10.1126/science.1058040. Venter, J. C., K. Remington, J. F. Heidelberg, A. L. Halpern, D. Rusch, J. a Eisen, D. Wu, I. Paulsen, K. E. Nelson, W. Nelson, D. E. Fouts, S. Levy, A. H. Knap, M. W. Lomas, K. Nealson, O. White, J. Peterson, J. Hoffman, R. Parsons, H. Baden-Tillson, C. Pfannkoch, Y.-H. Rogers, and H. O. Smith. 2004. Environmental genome shotgun sequencing of the Sargasso Sea. Science 304:66–74. doi: 10.1126/science.1093857. Venter, JC. 2013. Life at the Speed of Light. Viking, 240 pages. Publisher website. This entry was posted in bioinformatics, book review, genomics. Bookmark the permalink.